From the Greek “cyto” for cell and “kinos” for movement, these chemical messengers orchestrate the immune system’s activity, and may be the key to understanding and treating autoimmune disorders. Behind every complex organization, from great militaries to multinational corporations, is an equally sophisticated communications system. For the immune system, the body’s complex system for fighting off disease and infections, cytokines are the vital protein messengers that mediate activity. Produced mainly by T-cells and macrophages, this superfamily of small proteins has also been likened to the “software” that runs the immune system. When the body is fighting the flu, for example, two cytokines known as interleukin-6 and interferon-alpha are released by white blood cells. Their release creates an inflammatory response — including an increase in blood flood flow and swelling to the area — that signals the location of the infection and attracts other white blood cells. This inflammation is also what causes the symptoms associated with the flu, such as high fever, body aches and tiredness. Once the infection has cleared, anti-inflammatory cytokines turn off the immune response. Sometimes these messengers can become dysregulated (overproduction or defective production) resulting in a variety of conditions from autoimmune disorders to neurodegenerative diseases and cancers. For scientists, unravelling this “software malfunction” is complex because the combination of cytokines involved and whether they increase or decrease is different for every disease. “Although cytokines are dysregulated in every disease, the cytokines driving disease differ with each condition,” says James Clark, a Senior Director in Pfizer’s Inflammation and Immunology Research Unit in Kendall Square, Cambridge. Just as Tolstoy famously wrote, “All happy families are alike; each unhappy family is unhappy in its own way,” each disease is unique in its form of cytokine dysfunction, adds Clark. "Just as Tolstoy famously wrote, “All happy families are alike; each unhappy family is unhappy in its own way,” each disease is unique in its form of cytokine dysfunction." 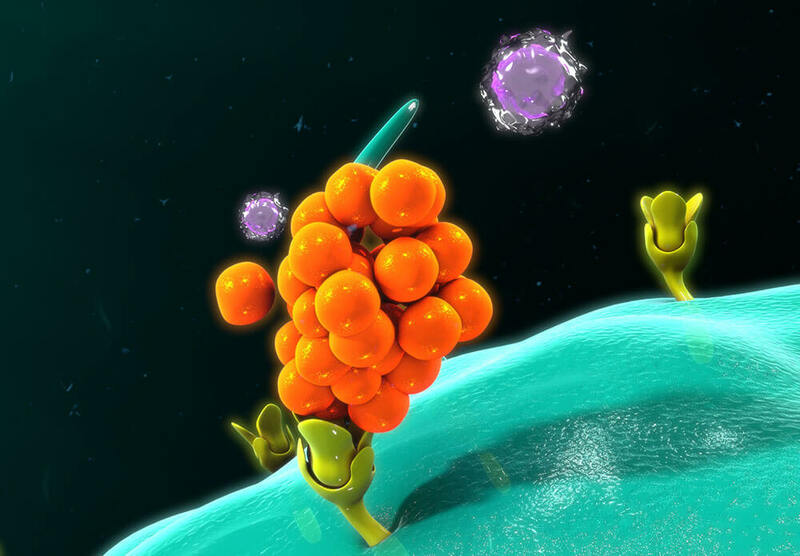 When cytokines become overactive (or up-regulated), it causes the immune system to attack itself. This can lead to excess inflammation, as well as autoimmune disorders such as rheumatoid arthritis, atopic dermatitis and type 1 diabetes. On the flipside, a defect in cytokine production (downregulated) is linked to a variety of immunodeficiency diseases. “Cytokine dysregulation can take a variety of forms. Scientists are trying to modulate that back to its normal state,” says Winkler. Scientists have developed a variety of methods to regulate the pro-inflammatory cytokines involved in autoimmune conditions such as rheumatoid arthritis (RA). Traditional biologic therapies target cytokines that linger outside cells and cause inflammation. In recent years, a new class of therapies has emerged known as Janus kinase (JAK) inhibitors. These small molecule medicines work by blocking JAK proteins. There are four JAK kinases, JAK1, JAK2, JAK3, and TyK2, which are vital to the inflammation signaling process inside the cell. When a cytokine binds to the outside of an immune cell, combinations of JAKs act as a “translator” sending an internal message that kicks off a chain of events, leading the cell to increase cytokine production, proliferate, become more adhesive, or produce other mediators in the immune response. “When these small molecules bind to the JAKs, they modulate their signaling pathway, which leads to reduction in the signaling and production of cytokines. By developing inhibitors with different potency for each JAK researchers can preferentially target different cytokines,” says Clark. While some types of JAK inhibitor may be effective for autoimmune conditions such as RA, Psoriatic Arthritis and Ulcerative Colitis, other autoimmune diseases such as atopic dermatitis (AD) may be best treated by JAK inhibitors that target different cytokines. “Matching the appropriate inhibitor with the disease will optimize the benefit and safety for patients. It is appropriate that JAKs are named after Janus, the Roman God of beginnings because scientists are just beginning to tap the potential of this class of compounds,” says Clark.